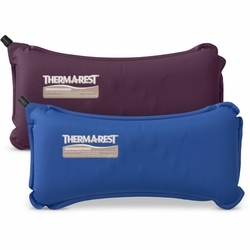 Therm-a-Rest Lumbar Pillow. Drawing on pressure mapping technology, the Lumbar Pillow features die-cut foam down the center to reduce pressure along the spine, while maintaining density on the sides for the lateral support. It’s self-inflating to allow a personalized level of support and can be adjusted with one hand to add critical comfort to bad seats anywhere.